THE NEIGHBORHOOD ON GAME DAY AND THE AFTERMATH » how's your morale? Last night the Seahawks netted a necessary and decisive victory over the Green Bay Packers. My understanding of what that means for their playoff chances is as follows: there are still chances. How good they are is yet do be determined. What is not yet to be determined is that every time the Seahawks play at home, the twin neighborhoods of the ID and Pioneer Square become the most densely inhabited areas in Washington state. Walking through Occidental Park this afternoon one could tell the neighborhood had been hit the night prior. Posters for various shows or dance nights ground into the concrete. The leaves that had been raked into easy piles the day before scattered by the tromping hordes. The vaguely shellshocked look on every service industry worker’s face. Even more than that, there’s a still in the air. It just feels like something big happened the night prior; the buildings themselves are recovering. Even the alley rats seem more skittish. I laughed and we chatted about how many people were surprised to learn that the Hawks were playing– at home– on Thursday. If that is true, it wasn’t evident last night, as every stranger in every bar, restaurant, or public space was jerseyed up. Mainly Seahawks jerseys, but a few Aaron Rodgers acolytes could be spotted. One person wore a cheese head hat. To describe sports fans as some sort of monolith is silly. Any given team is going to have fans from all walks of life, all political and religious persuasions, all sexual orientations, and all different tastes in culture and art. But when you leave your apartment and there are hundreds of people wearing the exact same thing, sometimes call-and-responsing at eachother with the never-not-annoying “SEA!” “HAAAAAWKS!” it’s easy to be less than generous. Each of Seattle’s teams has it’s own flavor of fandom; the Seahawks fans are famously the loudest. The Sounders fans LOVE their IPAs. The Mariners fans tend to be the least obtrusive; they’re the only team to play home games that I don’t realize are happening. I don’t know if this is a reflection of baseball’s more family-friendly vibe or specific to the Mariners. 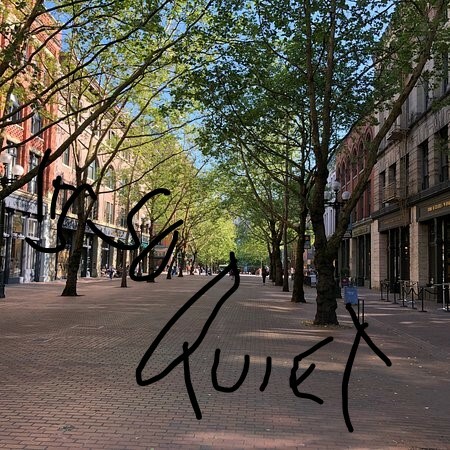 As Pioneer Square and the ID creak to life this afternoon, the aftershocks of the noise, the crowds, and the drinking to excess by folks who are only ever here to drink to excess and watch sports start to subside. The neighborhood gears up for a Friday night– lively in and of itself– and things start to get back to normal. Businessmen and off-duty baristas and activists share spaces while television screens play college basketball games. Some people watch, but more are having conversations, talking off their week, or preparing for a long haul working on other people’s weekend. City workers have corralled the leaves in Occidental Park back into semi-neat piles, just waiting for the stomping shoes that come with the next big game. Previous WILL THE NEXT SEAHAWKS OWNER BE AS GOOD AS PAUL ALLEN?